Laura Vilsack is a visiting researcher from the Gault School of Archeological Research. This article is part of the March 2018 TARL Newsletter. In 2001 and 2002, field crews collected 610 bulk soil samples from a single excavation block (Area 12) at the Gault Site in Bell County, Texas. 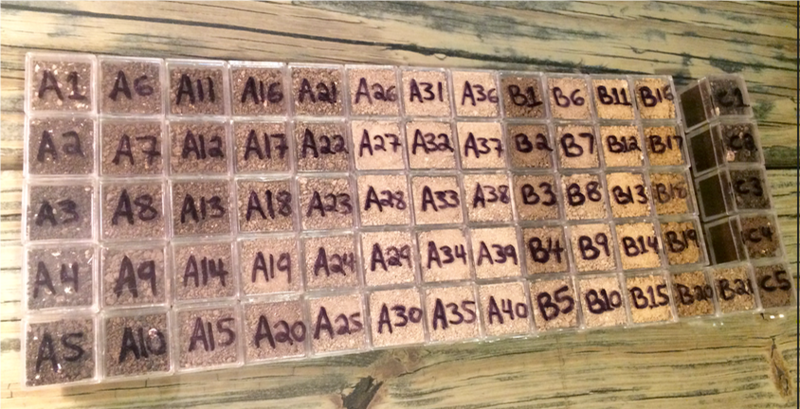 Today, these soil samples are currently being stored at the Texas Archeological Research Laboratory (TARL). I recently contacted TARL and borrowed a portion of the soil samples for magnetic susceptibility analysis to expand upon my thesis research completed in 2016 (Figures 1 and 2). For my thesis work (Vilsack 2016), I focused mainly on the vertical stratigraphy and depositional processes within Area 12 specifically relating to a unique prehistoric cobble feature dating to approximately 14,900 cal B.P. Additional research, from the loaned soil samples, allowed me to extend sampling horizontally across the block instead of just a single vertical profile. Figure 1. Example of the soil sampling strategy and location of samples collected from the field. Figure 2. Resulting soil samples compacted into paleomagnetic sample cubes. Analyzing the soil samples provides a great opportunity for me to address various questions concerning cultural activities around the cobble feature without having to return to the site to excavate the feature again. This feature is approximately 2 by 2 meters wide and varies in thickness between 5 to 15 centimeters. While the surface of the feature yielded very few artifacts, there was an abundance of Clovis and Older-than-Clovis lithic materials surrounding the cobbles. After acquiring a broad understanding of the depositional environment surrounding the feature, my next goal is to determine if there were any potential signatures of cultural or natural anomalies directly above, at the same elevation as, and within 10 to 15 centimeters below the cobble feature. 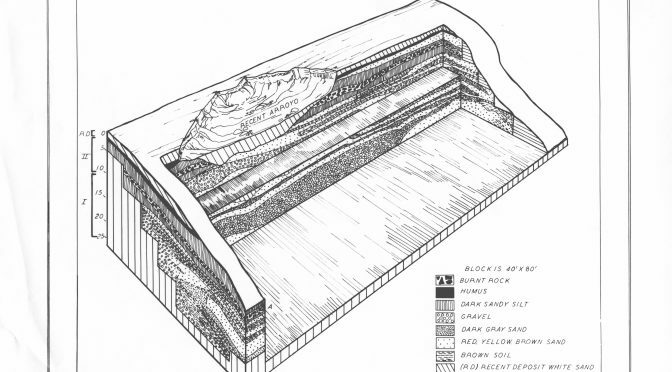 While magnetic susceptibility by itself does not reveal what type of anomalies occurred, it does aid in the identification of disturbances in the sediments relating but not limited to buried paleosols, movement of soils, organic debris left by humans and areas exposed to heat (Crowther 2003; Tite and Mullins 1971), middens (Dalan and Bevan 2002), and/or pits. Any anomalies detected with a magnetic susceptibility reader are of course dependent on the environment, type of soil, extent of the occupation, and density of the occupation. However, I expect and hope the results will highlight areas to focus further analysis on and reaffirm potential activity areas and/or toss zones identified by artifact densities and distributions that once surrounded this unique prehistoric feature. 2003 Potential Magnetic Susceptibility and Fractional Conversion Studies of Archaeological Soils and Sediments. Archaeometry 45(4):685-701. 2002 Geophysical Indicators of Culturally Emplaced Soils and Sediments. Geoarchaeology: An International Journal 17(8):779-810. 1971 Enhancement of the Magnetic Susceptibility of Soils on Archaeological Sites. Archaeometry 13(2):209-219. 2016 Investigations of Area 12: Gault Site. Master’s Thesis, Department of Anthropology, Texas State University, San Marcos. Timothy K. Perttula is an Affiliated Researcher at TARL. This article is part of the March 2018 TARL Newsletter. 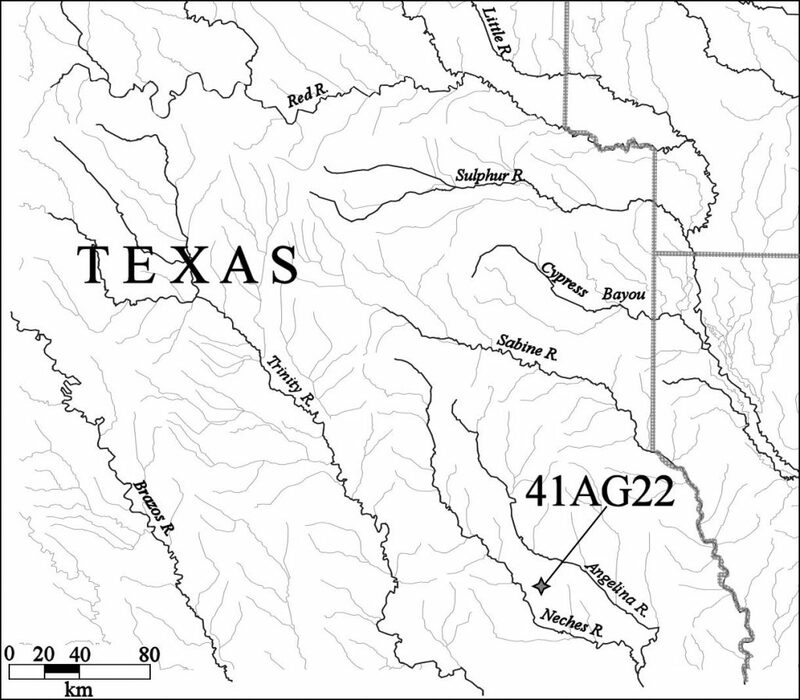 41AG22 is an Historic Caddo site on Jack Creek in the Neches River basin, about 10 km southwest of Lufkin, Texas (Figure 1). The site was located and recorded in November 1939 by Gus Arnold as ET-622 of the University of Texas during the WPA-sponsored archaeological survey of East Texas. This ancestral Caddo site covered about 3 acres in a plowed field, and was marked by three possible mounds about 18-23 m in diameter. Figure 1. Location of 41AG22 in East Texas. In 1924, the landowner, a Mr. Jumper, plowed the land where the site is located, and uncovered a human burial with a European trade and glass beads. About 10 years later, Jack Creek flooded and cut a channel through one of the possible mounds, exposing more human remains and ceramic sherds. When Arnold visited the site in November 1939, he collected ancestral Caddo ceramic sherds, lithic tools and debris, and one human molar from the plowed field. 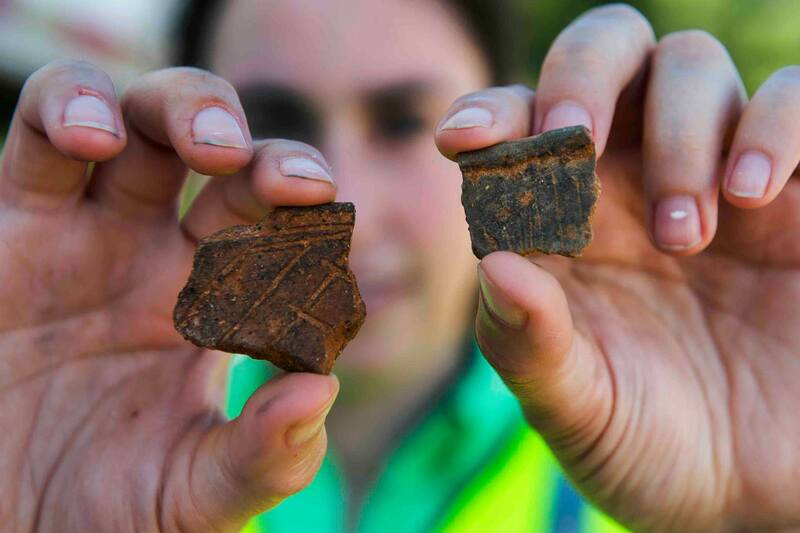 As part of long-term East Texas Caddo archaeological research, I recently analyzed the ceramic sherds from the site held by the Texas Archeological Research Laboratory at The University of Texas at Austin (TARL). The ancestral Caddo sherds from the sherd are overwhelmingly (91 percent) from grog-tempered vessels. Eight percent of the sherds are from vessels with grog and/or bone or crushed hematite inclusions, and only 0.5 percent of the Caddo sherds are tempered solely with bone. Only about 15 percent of the ceramic sherds are from plain vessels or the undecorated portions of decorated vessels. One of the plain body sherds has a 5.4 mm drilled perforation, and this sherd may have been used as a spindle whorl. The remainder are from utility ware vessels (n=158, or 95.8 percent of the decorated sherds) or fine ware vessels (n=7, 4.2 percent of the decorated sherds). The plain to decorated sherd ratio (P/DR) of the assemblage is 0.18, consistent with Allen phase sites in the Neches River basin to the north (Perttula and Stingley 2017:Table 22) as well as a few of the Allen phase sites on Bayou Loco in the Angelina River basin, east of 41AG22 (Perttula and Marceaux 2018:Tables 17 and 18). The brushed to plain sherd ratio of the 41AG22 assemblage is 5.17, and the ratio of brushed to other wet paste sherds is 3.75; both ratios are consistent with an East Texas Allen phase ceramic affiliation. More than 90 percent of the decorated sherds from 41AG22 have brushing marks, either as the sole form of decoration, or in conjunction with appliqued, incised, or punctated decorative elements. The brushed sherds are from Bullard Brushed vessels that have horizontal or vertical-diagonal brushing marks on the rim and opposed, overlapping, and parallel (likely vertically oriented) brushing marks on the vessel body. 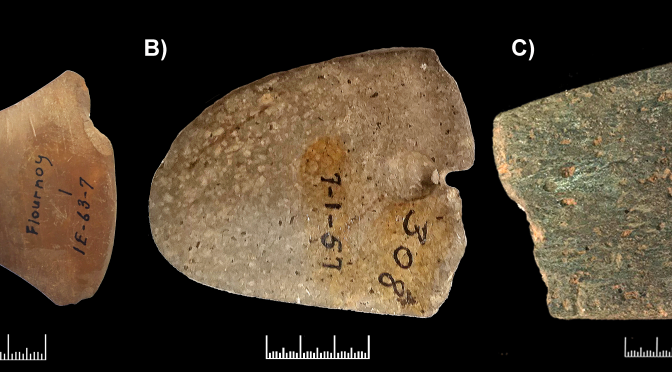 A number of the brushed-incised (n=20) and the brushed-punctated (n=2) sherds are also from Bullard Brushed vessels. Many of these sherds are from large and thick (>12-15 mm) jars. 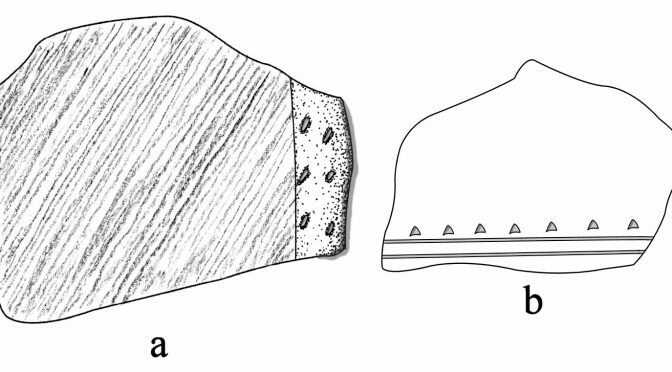 One brushed-appliqued body sherd has diagonal brushing marks and a straight appliqued fillet (Figure 2a). Thirteen brushed-incised body sherds are from Spradley Brushed-Incised jars. This utility ware is found on Historic Caddo Allen phase sites in the Neches-Angelina river basins in East Texas. It consists of parallel brushing elements with overlapping straight incised lines that are opposed or perpendicular to the brushing. Figure 2. 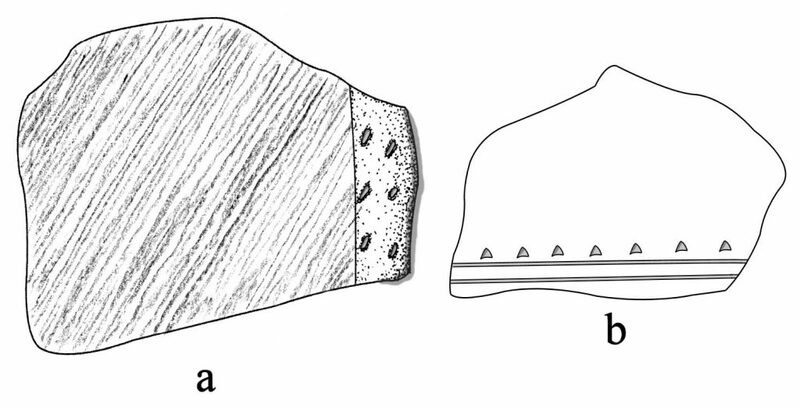 Decorative elements on selected utility ware sherds from 41AG22: a, brushed-appliqued; b, incised-punctated. The two sherds with parallel grooves in the 41AG22 assemblage are from a Lindsey Grooved vessel. Lindsey Grooved is an Allen phase utility ware type comprised of large bowls or jars with direct or slightly everted rims. The rims have shallow horizontal grooves. Lindsey Grooved vessels also occur in conjunction with appliqued, brushed, incised, or punctated elements, typically placed either at the rim-body juncture or on the vessel body. Other utility ware sherds have incised, incised-punctated, and punctated elements on rim and body sherds from vessels of unknown types. One of the incised-punctated sherds has two closely-spaced horizontal incised lines and an associated row of triangular-shaped punctations (see Figure 2b). The fine ware sherds in the 41AG22 assemblage include sherds from vessels with engraved (n=6) or trailed (n=1) lines. 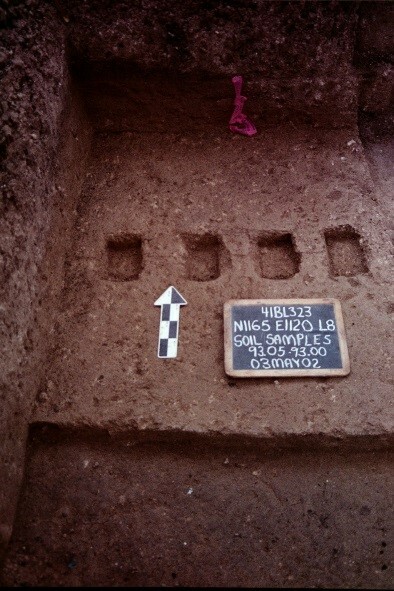 Three of the engraved sherds are from Patton Engraved vessels; such fine wares are one of the principal types in Historic Caddo Allen phase sites in East Texas. One of the Patton Engraved body sherds has upper and lower parallel rows of linear tick marks, and is from a Patton Engraved, var. Allen vessel (Perttula 2011:Figure 6-66a). The other two Patton Engraved sherds cannot be identified to a specific variety (Figure 3a-b). Another engraved rim sherd has both horizontal and vertical engraved lines (Figure 3c). Two other engraved sherds are from different carinated bowls. The first (Figure 3d) has horizontal engraved lines and a diagonal/cross-hatched zone between two of the horizontal engraved lines. 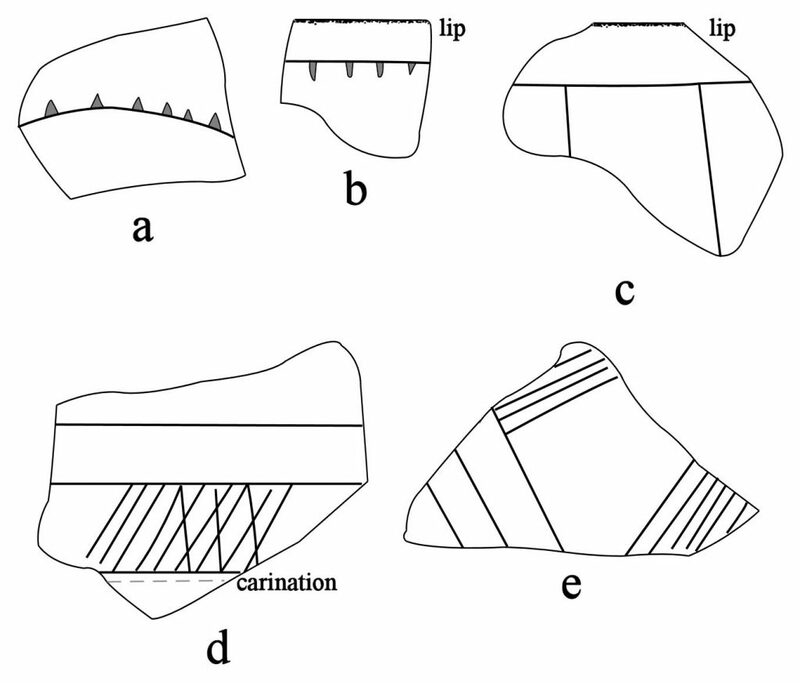 The second carinated bowl sherd has opposed diagonal engraved lines and zones filled with diagonal hatched lines (Figure 3e). The parallel trailed sherd is likely from a post-A.D. 1680 Keno Trailed vessel, probably a bowl (see Suhm and Jelks 1962:Plate 44; Schambach and Miller 1984:123). Figure 3. Selected decorative elements on fine ware sherds from 41AG22: a-b, Patton Engraved; c-e, other engraved rim and body sherds. 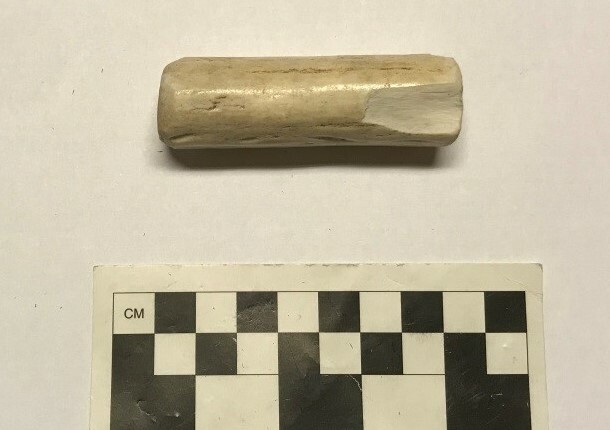 This analysis of the TARL collections from the site indicates that it was used first during the Woodland period, but that the principal use of the site was by Caddo peoples affiliated with Hasinai Caddo groups after ca. A.D. 1680 and up to ca. A.D. 1730, based on the recovery of primarily grog-tempered vessel sherds from known Allen phase ceramic types, including Patton Engraved, Lindsey Grooved, and Spradley Brushed-Incised, and one sherd of Keno Trailed. The specific cultural affiliation of the Caddo occupants of 41AG22 is not known, as almost all of the ethnographic and archival documents concern Caddo groups living near the Camino Real de los Tejas, not farther down the Neches River (see Perttula 1992:Figure 22). The Nacono are one possibility, as they lived below and to the south of the Camino Real, but they are only mentioned infrequently after ca. A.D. 1716 in archival documents, and may have “lost their separate ethnic and band identity” (Perttula 1992:220) by that time. 1992 “The Caddo Nation”: Archaeological and Ethnohistoric Perspectives. University of Texas Press, Austin. 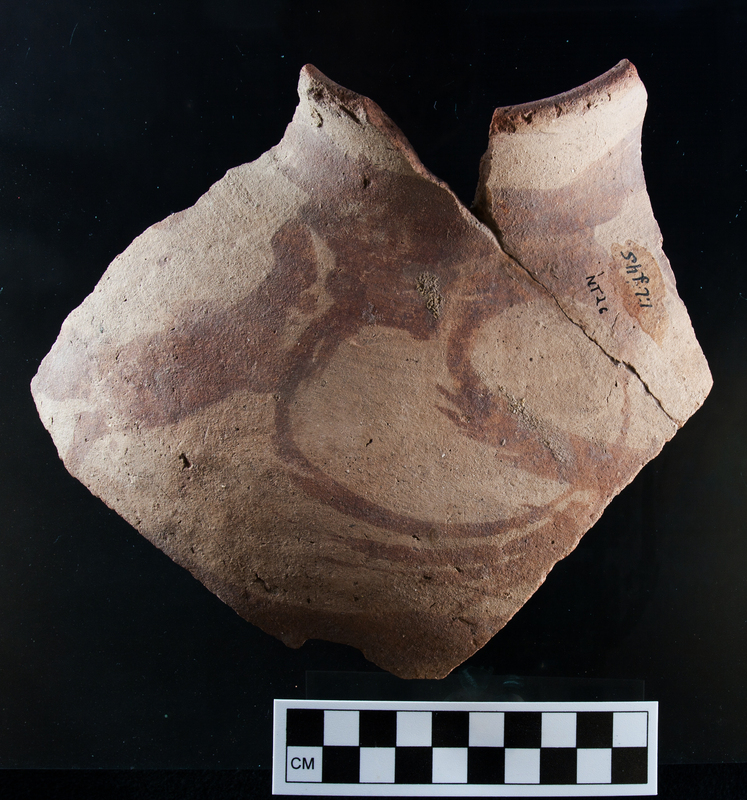 2011 The Ceramic Artifacts from the Lang Pasture Site (41AN38) and the Place of the Site within an Upper Neches River Basin Caddo Ceramic Tradition. In Archeological Investigations at the Lang Pasture Site (41AN38) in the Upper Neches River Basin of East Texas, assembled and edited by T. K. Perttula, D. B. Kelley, and R. A. Ricklis, pp. 145-320. Archeological Studies Program Report No. 129, Texas Department of Transportation, Environmental Affairs Division, Austin. 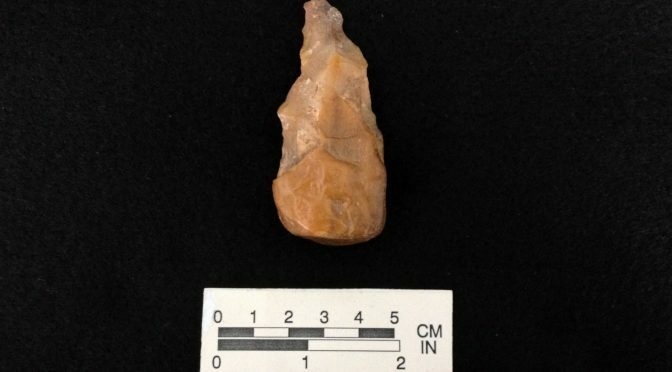 2018 The Lithic and Ceramic Artifacts from the Spradley Site (41NA206), Nacogdoches County, Texas. Special Publication No. 50. Friends of Northeast Texas Archaeology, Austin and Pittsburg. 2017 Archaeological Investigations at the Walnut Branch (41CE47), Ross I (41CE485), and Ross II (41CE486) Sites, Cherokee County, Texas. Journal of Northeast Texas Archaeology 76:31-70. 1984 A Description and Analysis of the Ceramics. In Cedar Grove: An Interdisciplinary Investigation of a Late Caddo Farmstead in the Red River Valley, edited by N. L. Trubowitz, pp. 109-170. Research Series No. 23. Arkansas Archeological Survey, Fayetteville. 1962 Handbook of Texas Archeology: Type Descriptions. Special Publication No. 1, Texas Archeological Society, and Bulletin No. 4, Texas Memorial Museum, Austin. Christopher W. Ringstaff is a visiting researcher from the Texas Department of Transportation (TxDOT). This article is part of the March 2018 TARL Newsletter. 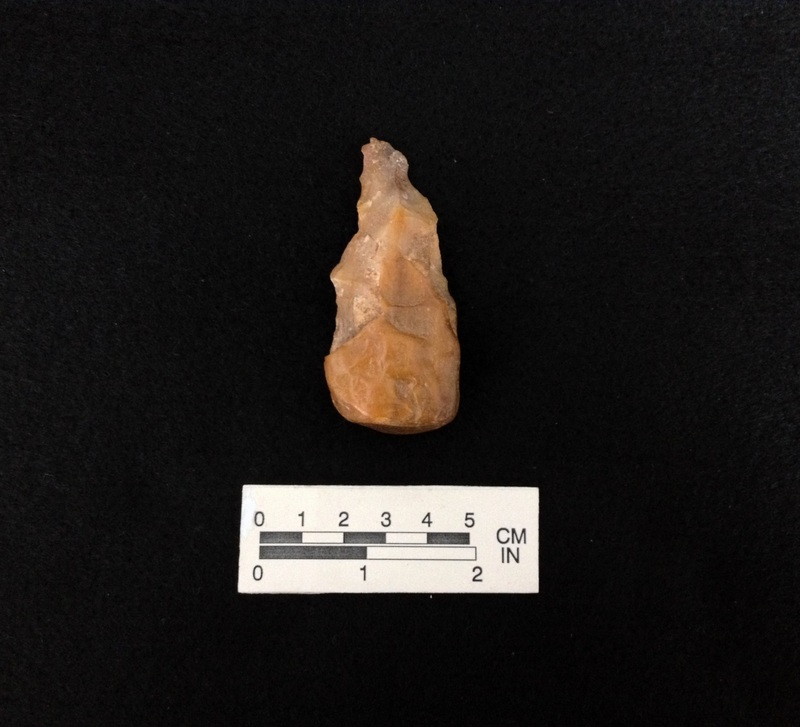 For the past several months, I have been looking at prehistoric flint knapping implements in the collections at TARL. As an experimental archeologist, having the best understanding of prehistoric tool kits used in chipped-stone tool manufacturing improves the quality and resolution of my research. The following is a brief overview of this research discussing sites, tools, and replicated tools. I examined collections from sites spanning three regions of Texas: Central Texas, the Lower Pecos, and the Coastal Plain. Sites studied included Gault (41BL323), Fate Bell (41VV74), Eagle Cave (41VV163), Morhiss Mound (41VT1), and the Crestmont Site (41WH39). The sites range in age from Early to Late Archaic. The items from Gault may be older but are from the Pearce Collection, an impressive but poorly provenienced collection made by one of the earliest investigators of the site. The site types from which these knapping implements were recovered are varied and include open campsites, rock shelters, and burial sites. The knapping implements reviewed included antler billets for direct percussion, antler tines for pressure flaking, and antler segments commonly referred to as punches or drifts for indirect percussion. Although many of the specimens were utilitarian and were apparently discarded, in the case of Crestmont and Morhiss Mound, some items were found together as knapping kits interred with deceased individuals as grave goods. Notable are the knapping kits found with burials associated with Features 4 and 9 at the Crestmont Site, which included an array of well manufactured punches. Also remarkable was the knapping kit from Burial 119 at Morhiss Mound that included a wide range of knapping tools including billets, tines, and possible punches. All of the Burial 119 artifacts remain covered in ochre. Figure 1. White-tail antler billet for soft-hammer direct percussion from Fate Bell Shelter (41VV74). Figure 2. Experimental white-tail antler billet for soft-hammer direct percussion. The attributes of these artifacts were used to model experimental knapping tools for replication and comparative use-wear. As an example, the size and weight of the antler billet from Fate Bell, among the larger ones thus far observed, was used to model an experimental billet as shown in Figures 1 and 2. Of particular interest during the course of this research were the punches used for indirect percussion. From the attribute data collected, replica punches were made and used in extensive experimentation. Initial results show consistency in use damage between the actual and experimental tools as shown in Figures 3 and 4. Results from this research should be completed in time to be presented at the 2018 TAS annual meeting. Figure 3. Probable punch for indirect percussion from the Gault Site (41BL323). Note impact spall. Figure 4. Replicated punch used for indirect percussion experiements. Note impact spall from use. Gus Costa is a visiting researcher from Moore Archeological Consulting, Inc. This article is a part of the March 2018 TARL Newsletter. Last year our team unearthed several curious bits of groundstone items in advance of road construction on Houston’s west side. One of these objects had been drilled all the way through; a defining characteristic of problematic, perforated, groundstone objects commonly known as “bannerstones.” As the leading “rock geek” of our office, I had the chance to help better determine what these broken bits represent, what they might mean, and why they’re important. Descriptions of bannerstones go back to the Civil War era when they were regularly labeled as “problematicals”. Some authors called them whale-tails, thunder-bird emblems, ceremonial axes, maces, and butterfly stones. Charles Conrad Abbott coined the term “bannerstone” in 1876. Most early observers were stuck by the elaborateness of these soft and fragile stone items. For nearly half a century the academic consensus was that these items represented non-utilitarian, ceremonial items. In the 1920s bannerstones found alongside antler hooks and handles led to the popular inference that bannerstones were used as spear-thrower or atlatl weights. The debate continues today as to what function(s) these enigmatic artifacts might have served. Figure 1. Fragmentary bannerstones from TARL’s collections (Photos B and C courtesy of Marybeth Tomka and Jason Barrett, scale is 3 cm). All are broken along the “barrel” or drilled perforation which is oriented perpendicular to the lateral wing-like elements shown here in plan view. Specimen A, is half of a butterfly type bannerstone from Flournoy Farm in Wood County. Butterfly bannerstones forms are uncommon in Texas but are more commonly reported in the northeastern region. Specimen B is half of a winged semi-lunar bannerstone from Morhiss (41VT1) in Victoria County. This specimen is notable as it represents the only published example of a broken bannerstone with a secondary perforation in Texas. Such extra-perforations are occasionally encountered elsewhere where they might represent mending activities or ornamental uses. Specimen C is a semi-lunar bannerstone from 41WA7 in Walker County. Bannerstones appear during the Archaic Period between 6000-5000 B.C. in the Ohio River Valley and parts of the Mid-Atlantic. They proliferate during the Middle Archaic and are replaced in the Late Archaic (at approximately 1800 B.C.) by boatstones (another type of groundstone artifact) and gorgets. Bannerstones are scarcely known in the archeological record of Texas. Only a handful of bannerstones are present within the Texas Archeological Research Lab (TARL). Last year I visited TARL to examine some of these artifacts as part of a larger effort to characterize the Archaic bannerstones of Texas. At present I’ve documented nearly 40 bannerstones from all over Texas, primarily in the southeastern areas along the Gulf Coastal Plain. Bannerstones are fascinating, uniquely American artifacts that are rare, neglected and difficult to make. They can also be useful indicators of long distance exchange of materials and ideas. Petrographic analysis of the bannerstones found by the Moore Archeological team show that an exotic source of granite, hundreds of miles away from Houston, was exploited by Archaic people. Richard Walter and Andy Cloud are visiting researchers from the Center for Big Bend Studies at Sul Ross State University in Alpine, Texas. This article is part of the March 2018 TARL Newsletter. In the 1940s, pioneer archaeologist J. Charles Kelley hypothesized that sometime after A.D. 1450, villagers from the La Junta region began making their own pottery rather than acquiring it from outside sources in the Casas Grandes and Jornada Mogollon regions as they had done for the previous two hundred years. Their new, local-made pottery was distinguished from earlier wares by being largely undecorated sand-tempered brownwares with a lesser number of decorated and surface-treated vessels bearing simple designs (Fig. 1). Limited petrographic and Instrumental Neutron Activation Analyses (INAA) have largely supported Kelley’s hypothesis, but additional analyses are needed to refine our understanding of these local wares. The La Junta Ceramic Project, designed to address this shortcoming, focuses on these later brownwares from five village sites at La Junta. 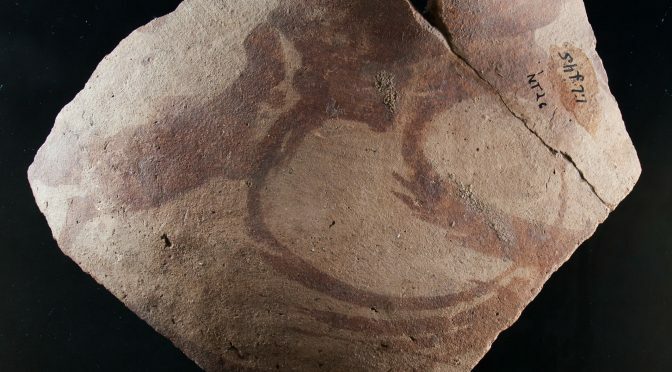 The Center for Big Bend Studies (CBBS) plans to submit around 300 sherds for both INAA and petrographic analyses from collections housed at the CBBS and the Museum of the Big Bend—both of Sul Ross State University in Alpine, Texas—and the Texas Archeological Research Laboratory (TARL) in Austin. Figure 1. Partial Red-on-Brown olla recovered from the Millington Site (41PS14). Courtesy of the J.Charles Kelley collection at TARL. CBBS archeologists Taylor Greer and Richard Walter recently chose ca. 70 plain brownware, red-on- brown, surface-treated, and slipped earthenware sherds from various La Junta village sites housed at TARL. Most of these sherds were recovered from the Millington site (41PS14), a pueblo occupied by various groups over time and the site of Mission San Cristobál established ca. A.D. 1684. The project is being funded by the Texas Preservation Trust Fund with additional help from the National Science Foundation Subsidy Program for Archaeological Research at the Missouri University Research Reactor Center. Results from these studies are expected to provide new insights concerning acculturation, cultural interactions, and social systems of the La Junta villagers during a period of rapid cultural change amidst Spanish missionization and colonization. This article is part of the March 2018 TARL Newsletter. This map collection is available for both professional and avocational researchers to use. Please let TARL staff know ahead of time, so that we can retrieve the maps you have requested to view. The map file for the Rob Roy Site, 41TV41, contains the original stratigraphic profile drawings of various parts of the excavation blocks. 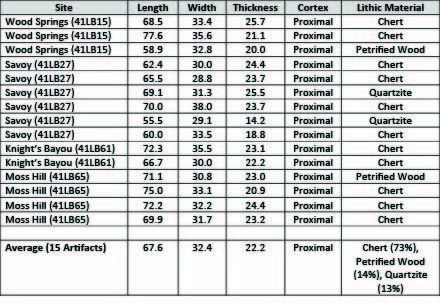 These profiles are very helpful since the professional archeologists did not provide a thorough discussion of the soil stratigraphy for all the different parts of the site in their field notes summary. 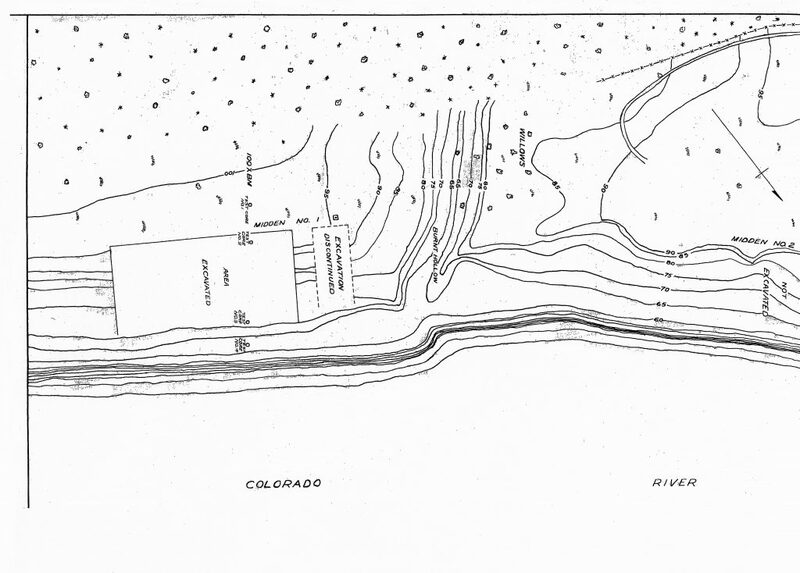 The map file also contains the original contour map drawn of the site and surrounding vicinity on a large Mylar sheet. This map is invaluable since the site and surrounding river valley are currently partially inundated by Lake Austin. It has sufficient detail for usage in scientific publications. Figure 1. 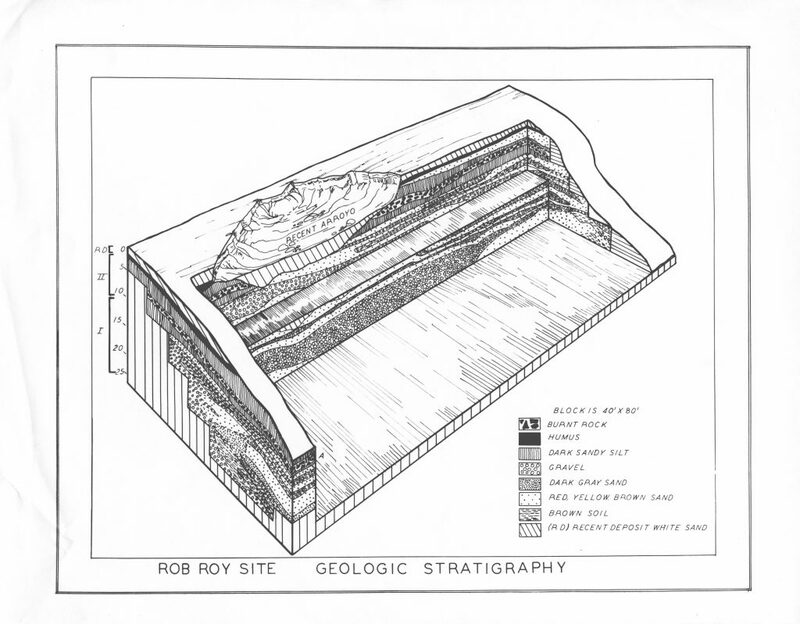 Plan view of excavated area of the Rob Roy site. made by archeologists employed by the WPA, and have been helpful in reconstructing the work done by the WPA teams. Nadya Prociuk is an Affiliated Researcher at TARL. This article is part of the March 2018 TARL Newsletter. For the past several months, TARL’s own Lauren Bussiere and I have been working with the A. E. Anderson Collection, which has been housed at TARL for more than 65 years. A. E. Anderson was a civil engineer based in Brownsville, and over the course of his career he surveyed and collected from around 200 sites in the Rio Grande Delta, both in Texas and Tamaulipas. 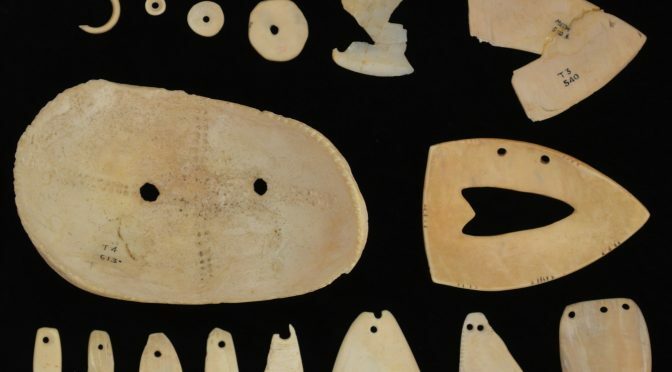 Anderson’s collection contains over 2, 000 prehistoric artifacts such as shell ornaments and tools, chipped stone tools, bone, groundstone, and ceramics. Thanks to his lifetime of work, Anderson’s collection is the most significant resource currently available for the study of the cultural prehistory of the Rio Grande Delta. Figure 1. Vessels of Huastecan origin in the A.E. Anderson collection housed at TARL. 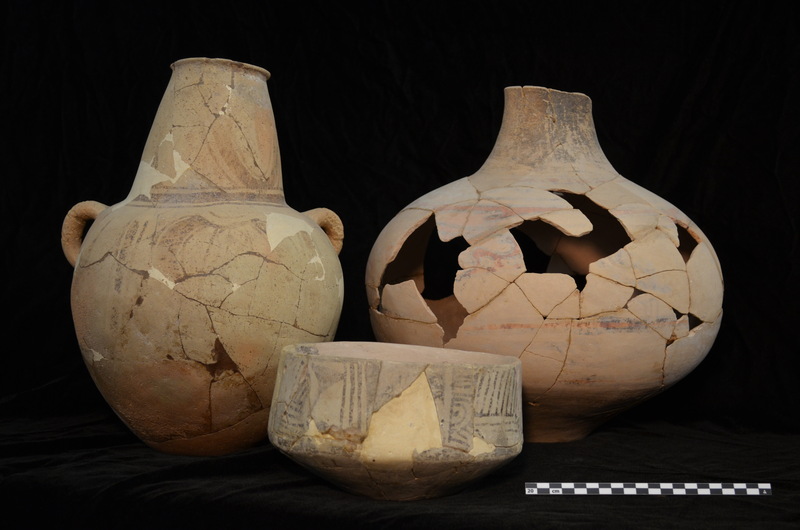 These vessels were first identified by Gordon Eckholm as demonstrating a connection between the prehistoric inhabitants of the Rio Grande Delta and the Huastecan groups further south along the coast. Several researchers have worked with the Anderson Collection over the years, though none have completely inventoried or analyzed the collection up to this point. T. N. Campbell studied the collection when it first arrived at the University of Texas in the 1940s, and Richard MacNeish also used the collection as a starting point for his definitions of the Brownsville and Barril Complexes. In the 1970s Elton Prewitt re-surveyed the Anderson sites located in Cameron County, and compiled an inventory of the artifacts from those sites. Multiple salvage and cultural resource management projects have been undertaken in the Rio Grande Valley that have added to our understanding of the archaeology of the area. Unfortunately, work with Anderson’s collection stalled until the late 1990s when William J. Wagner III completed a Master’s thesis on the ceramics in the collection. With his research Wagner confirmed Gordon Eckholm’s early assessment that a number of the ceramics in the Anderson Collection actually came from the Huastecan region of the Mexican Gulf Coast, suggesting significant long-distance trade ties with that area. Though other research has been done in the Rio Grande Delta area since that time, such as Tiffany Terneny’s Doctoral dissertation analyzing local burials, Wagner’s ceramic analysis was the last substantive work done with the Anderson Collection until now. Nearly a year ago Lauren approached me about an opportunity to contribute to an upcoming edited volume on trade and cultural interaction in North America, and suggested using the Anderson Collection to look at potential interactions between the Rio Grande Delta area and the Huastecan region. We decided to collaborate on the paper, which has proven to be an unexpectedly rich undertaking. 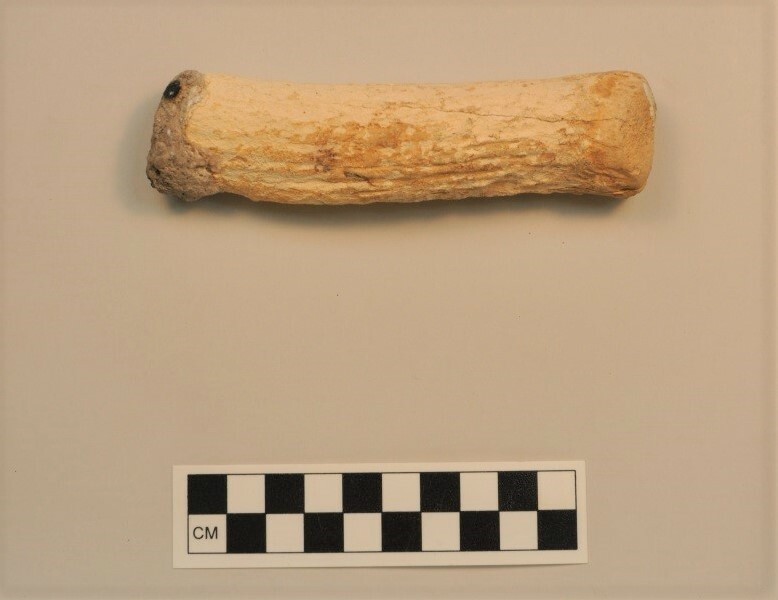 Our goal in writing the paper has been to understand the nature of the interaction between the cultures of the Rio Grande Delta and the Huasteca, including what types of items they may have been trading. We have also sought to provide an example of how cultures which may be considered marginal, such as those of the Rio Grande Delta, can be active participants in wider economies of trade and exchange. An added benefit of our research is also to raise the profile of this archaeological region both within Texas and farther afield, since it is often ignored in favor of other areas. We have submitted the first draft of our chapter to the editors, and publication is expected sometime in 2019. In addition to our book chapter, we will be presenting our research at the Annual Meeting of the Society for American Archaeology in Washington D.C. this April, and are looking forward to spreading the word about this fascinating region and getting feedback on our research. 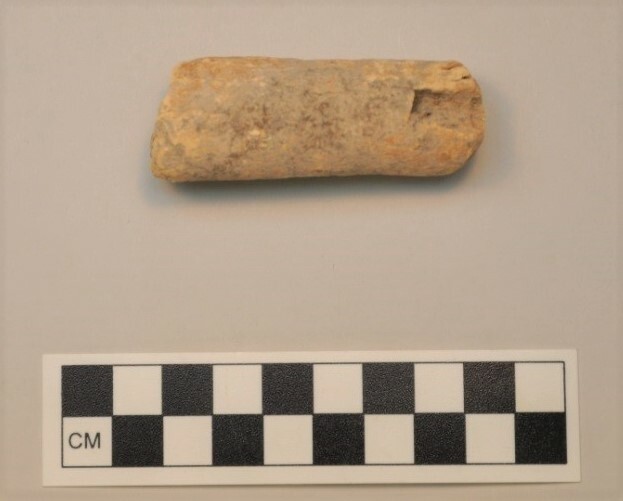 While conducting the research for these projects it became clear to us that though the Anderson Collection is an invaluable resource for the study of the archaeology of the Rio Grande Delta, no comprehensive inventory has been completed since Anderson was in possession of the collection. Such an inventory, with up-to-date classifications, artifact counts, locations, and site information, is a necessary step towards TARL’s goal of making this collection accessible to future researchers. To that end I have been working with the collection since January, and have been fascinated particularly with the abundant use of shell both as ornament and also for tools. It is clear that the people of the Rio Grande Delta were adept at utilizing the abundant marine resources at their disposal to craft a variety of utilitarian and decorative items, and that this shell industry was likely a key element in their interaction with outside groups. It is our hope that through this work the Anderson Collection will become a productive and useful resource for future study of the Rio Grande Delta area, and that others will begin to take a more active interest in pursuing research in this intriguing area. We know that there are many interesting field projects out there looking for students and promising to help you build your skills, gain experience, and expand your professional network. But which ones are the best fit for your goals (and your budget)? To help students and others looking for fieldwork opportunities this year, we’ve put together this list of recommended projects. For most projects listed below, students can earn course credit while gaining archeological field experience through these accredited field schools. We recommend that every archeology student attend at least one field school before graduating. Many field schools also accept volunteers–participants who do not earn course credit, and may not be current students. Costs listed below do not include tuition and fees or travel, but most include room and board. Many programs have scholarships available. Excavate Maya settlements from the Classic to the Postclassic in the subtropical jungles of northern Belize. This year’s program will include a 2-day workshop in skeletal analysis. Cost: US $1,765 for one session or $2,765 for both sessions. Excavate Maya sites dating from the Preclassic through the Classic period in western Belize. Course credit available through Northern Arizona University. 2018 Dates: Session 1: May 27 – June 23; Session 2: July 1 – July 28. 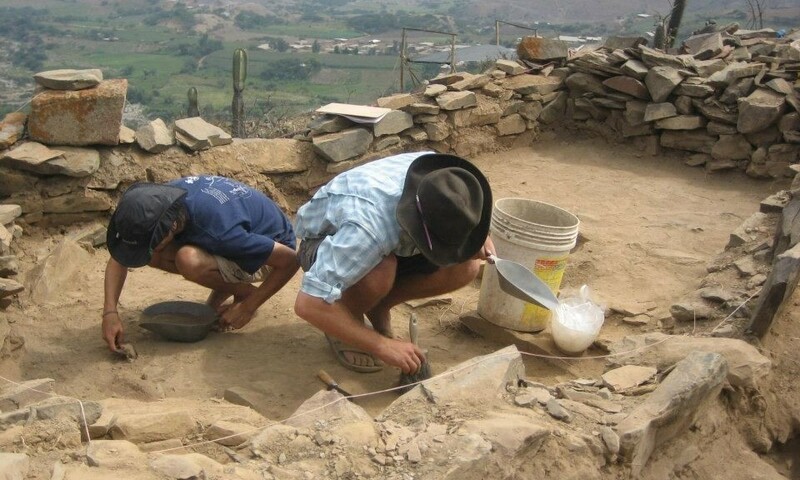 An archaeology and bioarchaeology field school on the north coast of Peru. Course credit available through the University of North Carolina at Chapel Hill. Below are some accredited field schools for students who want to broaden their experience in North American archaeology. Excavate the second-largest known prehistoric site in the United States. Course credit available through Wichita State University. Info: Contact Dr. Donald Blakeslee or the WSU Anthropology department. Learn anthropological and forensic archeology at a field site on the Caribbean island of Saint Eustatius, with a lab component at Texas State University. Info: Contact Dr. Todd Ahlman (toddahlman@txstate.edu) at Texas State University. 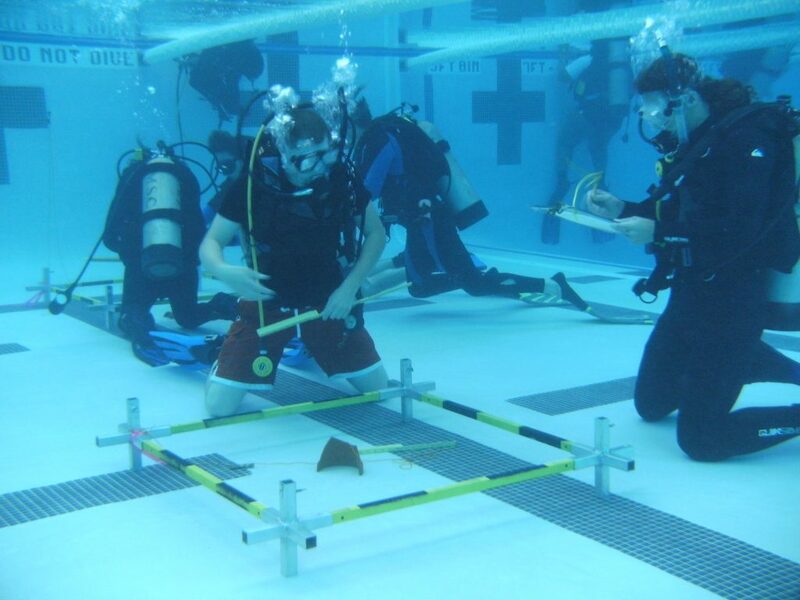 Learn techniques of underwater and terrestrial archaeology at sites near Pensacola, Florida. Course credit available through Florida State University. 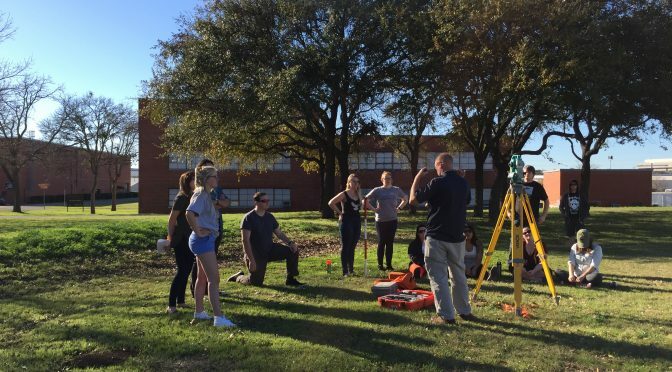 Below are some highly recommended field schools in Texas, as well as two volunteer opportunities for students and graduates. This year the Texas Archeological Society field school will return to Camp Wood to excavate historic Mission San Lorenzo de la Cruz. Course credit is available to students through Texas Tech University; the TAS field school is open to all TAS members as well. The TAS field school is an excellent opportunity for archaeologists under 18. 2018 Dates: TAS field school June 9 – June 16. TTU field school May 19 – June 22. Cost: TAS field school $100+ depending on length of stay, plus TAS membership. TTU field school $850 plus tuition. Info: Texas Archeological Society; for Texas Tech field school contact Dr. Tamra Walter (tamra.walter@ttu.edu). Info: Contact Dr. Bryon Schroeder (bryon.schroeder@sulross.edu). The Llano Uplift Archeological Society is currently conducting fieldwork on Cherokee Creek, at the westernmost known Caddo site in Texas. They are looking for volunteers for Saturday excavations. Info: Contact LUAS coordinator Charles Hixson (charles.hixson@gmail.com). 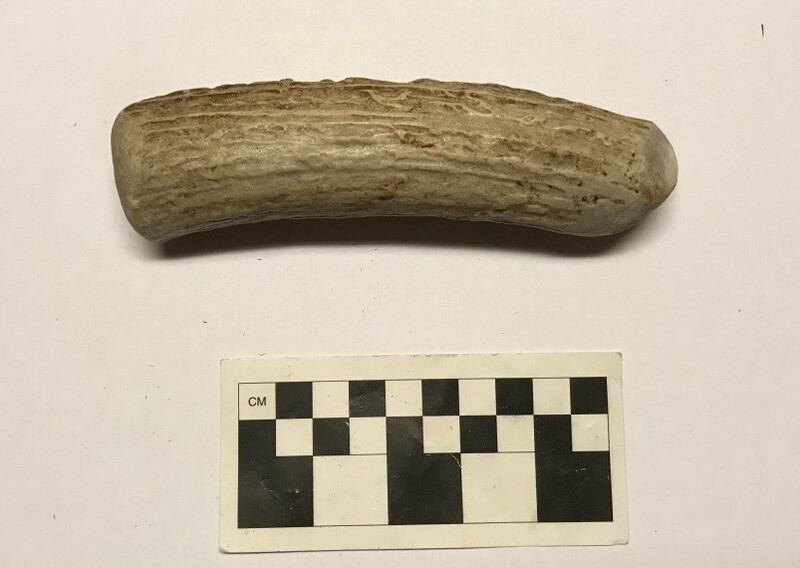 The Travis County Archeological Society is currently conducting excavations at a site near Bastrop in central Texas, in conjunction with the Archeological Stewards program of the Texas Historical Commission. They are looking for volunteers for Sunday mornings. Info: Contact Nick Morgan (nlmorgan@earthlink.net). 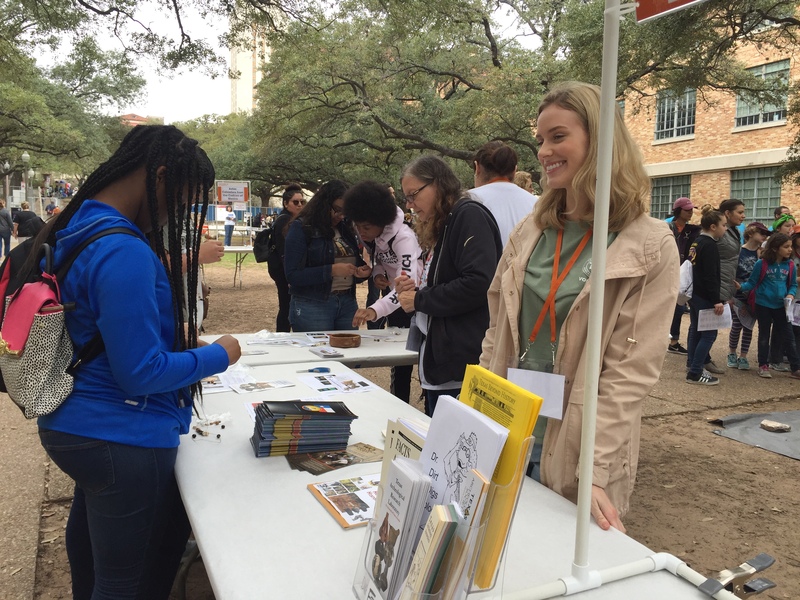 This past weekend, TARL staff and students got to join in one of our favorite events of the year: Explore UT! 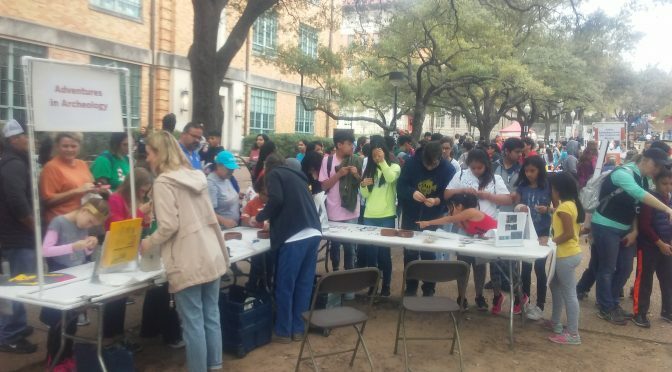 Each year, the University of Texas opens its campus to thousands of K-12 visitors to give them a look at college life. Each department and research unit is invited to participate by sharing activities that can help students learn about the many majors and career paths open to them as a future UT student. We had an amazing turnout this year–thousands of students from across the state came out to visit the UT campus. With the help of several amazing student volunteers and friends, we shared a hands-on activity, flintknapping demonstration, and artifact show and tell with a huge number of kids, educators, and parents. We want to say a huge thank you to our volunteers! This day would not have been possible without your help. 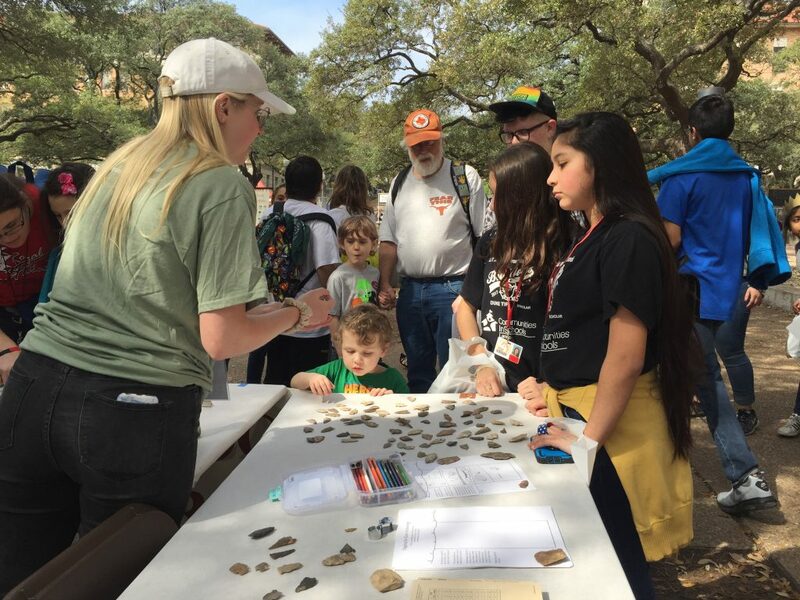 Thank you for helping us share our love of archeology with the next generation of UT students! 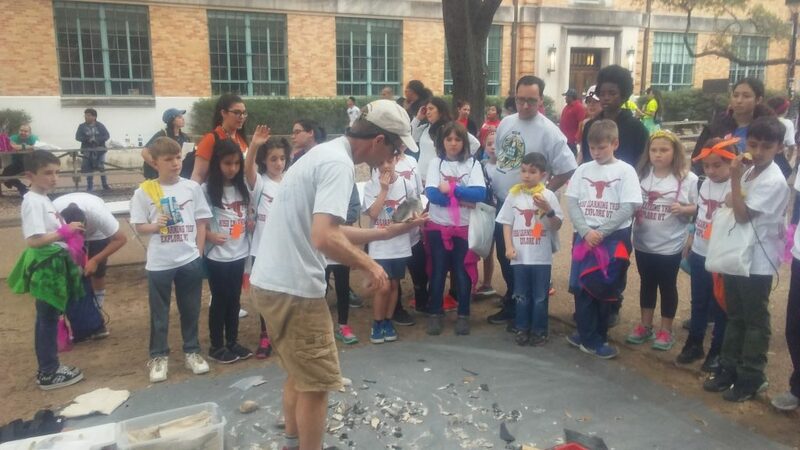 TxDOT archeologist Chris Ringstaff demonstrates flintknapping (stone tool making) to a group of students. TARL Intern Mallory shares info with visitors. 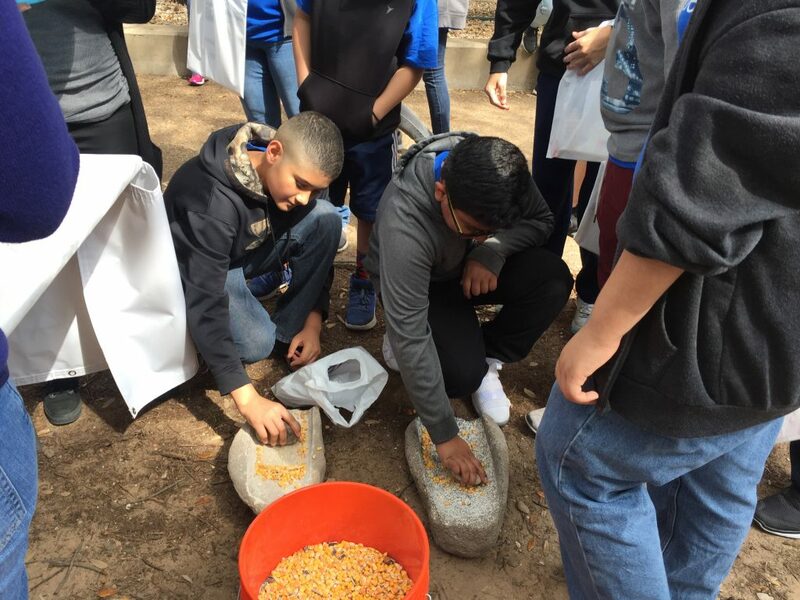 UT grad students brought manos and metates to demonstrate prehistoric food preparation techniques. TARL Intern Ann Marie discusses artifacts with students and parents.